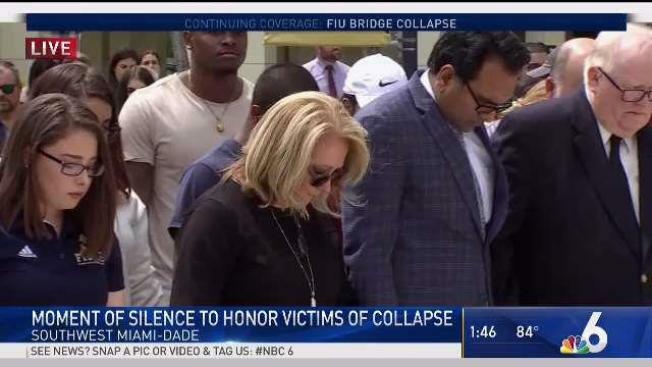 Florida International University held a moment of silence for the six people killed in a bridge collapse. Florida International University President Mark Rosenberg joined students and staff to hold hands and bow their heads for a moment of silence at 1:47 p.m. ET Monday to honor the victims of a bridge collapse that killed six people. The moment of silence was the first in a series of memorials as classes resumed on campus after the university's spring break. In a statement, Rosenberg said a blood drive was scheduled Tuesday to support wounded victims who remain hospitalized. The Student Government Association will hold a vigil Wednesday morning for Alexa Duran, an FIU student killed when the bridge collapsed on her car. Duran's sorority will hold a memorial for her Thursday evening. Students returning to class said they were angry that traffic was allowed to flow under the bridge while testing continued on the 950-ton structure. Meanwhile, the first civil lawsuit relating to the bridge collapse was filed Monday after Matt Morgan, an Orlando-based lawyer, announced it on Twitter late Sunday. The Miami Herald is reporting that the case involves Marquise Hepburn, who was injued when riding his bike under the bridge after a car hit him trying to escape the collapse, according to a lawsuit filed in a Miami circuit court. “It is imperative we act quickly to secure critical documentation & data,” Morgan wrote. Authorities identified the sixth and final victim Sunday. Miami-Dade Police and the family of Brandon Brownfield confirmed that the father of three was killed in the collapse. "I want to thank you all for your continuous love and support and prayers over the last 3 days," his wife, Chelsea, wrote on social media. "The coming days are going to be excruciating, as we dig deep to find the strength we need to heal." 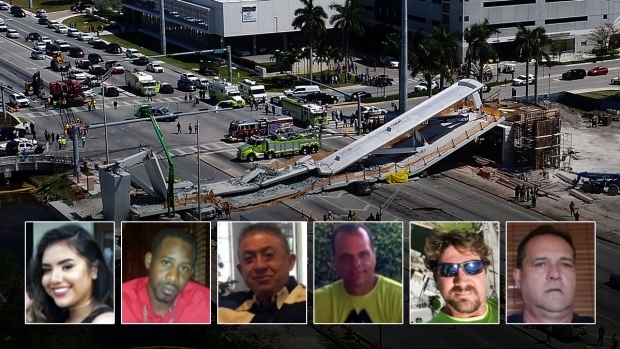 Police have identified all six victims of the deadly pedestrian bridge collapse near Florida International University. NBC 6's Erika Glover takes a look at the lives lost and reports on what we know about the victims. Navarro Brown, a 37-year-old employee with Structural Technologies VSL, was listed among those killed. He had died at the hospital. Ronaldo Fraga–Hernandez's gold Jeep Cherokee was pinned underneath the weight of the concrete. Osvaldo Gonzalez and Alberto Arias, friends and business partners, happened to pass under a Miami bridge that Thursday afternoon, the road bustling with fellow drivers also out on the most ordinary and nonthreatening of life's tasks. Their bodies were found Saturday inside their white Chevy truck as rescuers for days painstakingly dug through the debris. Investigators are still trying to figure out what caused the bridge to crumble —a bridge that was built with the intent of allowing people to safely cross the busy roadway. Cracking had been reported in the concrete span in the days before and crews were performing what's called "post-tensioning force" on the bridge when it flattened onto the busy highway. New video released Sunday showed one teenager being rescued from a vehicle shortly after the collapse – while his friend was not able to be saved. Richard Humble, a 19-year-old student, had not been feeling well earlier in the week. On Thursday, his friend Duran, the nicest person he said he ever knew, gave him a ride to his doctor's office to pick up some medication. They stopped at a red light, under the bridge. He sat on a curb as rescue workers checked out the cuts on his leg and slight fracture in a vertebrae. He remembers asking, "What do I do?" 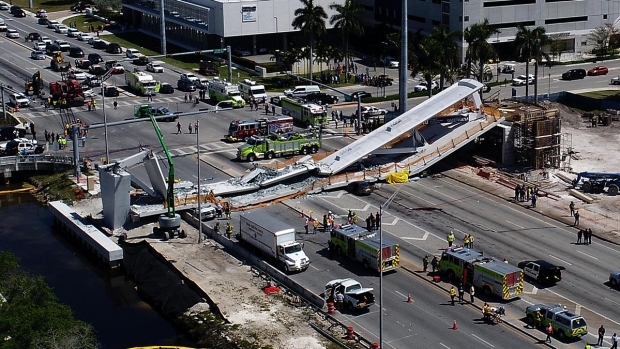 As investigators scour the wreckage of the pedestrian bridge that collapsed near Florida International University, they will likely focus on the steel cables that were being tightened when the 950-ton concrete slab fell onto the highway below, crushing several vehicles and leaving six people dead. NBC 6's Tony Pipitone reports. "How is it that a strong bridge falls down like a piece of board," she asked.